Contains magnesium in the form of citrate, with the addition of vitamins B1 and B6. Helps to optimize the level of neurotransmitters. Supports energy homeostasis of the system. Helps to keep up good mood. Conditions the work of the nervous system. Magnesium in one of its most easily absorbable forms - citrate, which is an extracellular cation, essential for the proper functioning of muscles. Its deficiencies are manifested by excessive, painful cramps in the calves and eyelids. It also has an auxiliary role for the vitamin B6 contained in the supplement, and it also supports the body energy homeostasis. Vitamin B6 - is one of the compounds that have the greatest impact on the nervous and hormonal systems. Deficiencies of vitamin B6 are manifested e.g. by low mood, including depression, as well as insomnia and memory problems. Vitamin B1 - plays the key role in regulating the intracellular processes of obtaining energy by cells with high metabolic rate. It coordinates one of the most important stages, enabling the commencement of aerobic metabolism, which is the source of a lot of ATP. Many people associate magnesium supplementation with preventing excessive muscular contractions. This is a justified conviction, because many amateur and professional athletes use this solution, which has been confirmed as efficient on the molecular level. To initiate the process of muscle contraction, the presence of calcium cations, involved in the release of the neurotransmitter acetylcholine, and the movement of myofilaments that shorten the length of the muscle, is required. Their excessive amount within the synapses results in increased release of the mediator, while intracellularly it leads to excessive shortening of the actin-myosine complex. These two mechanisms lead to the prolonged contraction of the given muscle group. Magnesium cations are competitive in relation to calcium ions, and the above-mentioned pathomechanisms are the result of their deficiency. Therefore, supplementing the diet with products rich in magnesium in its highly bioavailable form, results in the withdrawal of symptoms associated with painfully tense muscles. Apart from improving the somatic condition, modern supplementation more and more often focuses on enhancing the capabilities of the central nervous system. It is the right approach, because nowadays the multitude of external stimuli can lead to disturbed balance of neurotransmitter systems in the brain. Vitamin B6 is one of the substances acting on the central nervous system, whose visible effect was observed in people suffering from depressive disorders. It promotes the production of two neurotransmitters responsible for feeling pleasure - dopamine and serotonin. In addition, magnesium contained in the supplement shows synergy with pyridoxine hydrochloride, but at a slightly different binding site - by modulating the functions of glutaminergic NMDA receptors. It is worth adding that supplementation with vitamin B6 may prove to be helpful in older people, because it improves cognitive functions, especially memory processes. Apart from that, athletes using doping substances take large doses of vitamin B6 in order to lower the prolactin level, which is related to the increased secretion of dopamine. The principle that a specific energy dose is needed to perform any action, is applicable both in everyday life and in molecular intracellular pathways. Muscle and nerve cells have a particularly high demand for large doses of energy, therefore any dysregulation of energy-acquiring processes impedes the cells’ functioning. ATP is a molecule which is a kind of a ‘metabolic reservoir’. It is obtained in complicated cycles from compounds supplied with food - carbohydrates and fats. This happens with the help of special enzyme proteins that require the presence of vitamins and microelements for proper action. These include magnesium and vitamin B1 contained in the supplement. Their effect is somewhat complementary, because the deficiency of thiamine leads to lactic acidosis, due to the lack of the possibility of burning energy substrates (including glucose - the basic fuel) with the participation of oxygen. The lack of magnesium cations results in impaired metabolism of simple sugars in the glycolysis process. As you can easily see, without these two seemingly insignificant compounds, myocytes and neurons cannot even initiate their work, which can give such noticeable symptoms, as muscle weakness or deterioration of cognitive functions. 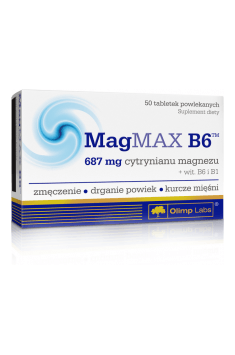 To sum up, Olimp MagMax B6 is a dietary supplement containing a high dose of magnesium in combination with vitamins, designed especially for people who are struggling with mood disorders, excessive muscle cramps, or want to support the energy processes of cells. 1 tablet 1-2 times a day after a meal. The recommended daily dose for magnesium is 200-400 mg (2-4 capsules a day). It is best to take the preparation during or a moment after a meal. For a start, however, take 2 capsules a day and gradually increase, as taking the supplement in a too high dose may have a laxative effect. Microcrystalline cellulose - bulking agent, magnesium stearate - anti-caking agent, potato starch, polyvinyl alcohol, polyethylene glycol, talc, potassium aluminum silicate, polyoxyethylene sorbitol monooleate - glazing agents, titanium dioxide - a color.